What does modern DNA research now prove about the theory that simple cells evolved into all life on earth? Simply that evolution is impossible. So why is this information being kept from the general public? Should Darwins theories still be taught as facts in our educational institutions? 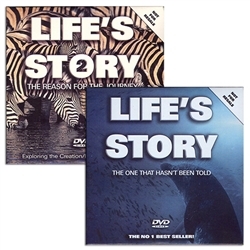 Filmed and researched over a five-year period in more than ten different countries, Life’s Story explores all these issues and many more in on the most visually stunning and informative wildlife productions available today. A factual and visual feast from beginning to end. It takes you on an incredible documentary journey of discovery to unravel some of the most amazing mysteries of the natural world. From simple cells in the seas to fish, amphibians, reptiles, birds, mammals and eventually humans; this we are told has been the evolutionary tree of life. So how does this theory fit in with all we see around us? After thousands of years of observable evidence and advances in biological research, do Darwin's evolutionary ideas measure-up to the discoveries of modern science today? In this program you will learn about the navigation techniques and defense mechanisms of marine life, the complex behavior of birds, the differences between apes, monkeys and humans, "ape-men" mixing link hoaxes, and how some of the large mammals feed and digest their food. From Egypt and the depths of the Red Sea to the Islands of Malta, the Cape of Good Hope and the Savannahs of South Africa, now you can see for yourself and understand the intricate designs of natures vast array of creatures and our place among them in this wonderfully created world. Many unusual, rare and endangered species are featured in this program including animal behavior never filmed before.